That belonging to something of greater importance. Contracts usually describe a main structure and add a catchall for all appurtenances. • In real estate law, easements, or the right to use another's property, may be appurtenant or in gross. • If appurtenant, then the easement belongs to what is called the dominant estate (property) and passes to new owners for all time until the easement is abandoned. 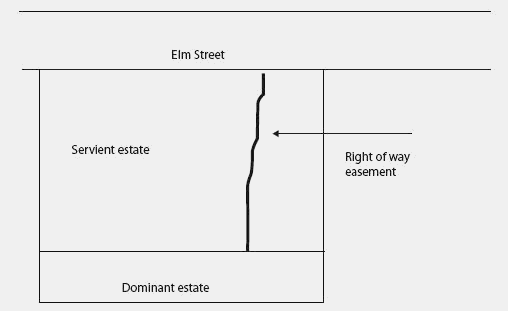 For example, an easement for ingress and egress over another's property is an easement appurtenant. The property that enjoys the easement is the dominant estate, and the property over which one may travel is called the servient estate. A sale of the dominant estate automatically includes a transfer of the easement, because it is appurtenant. • Contrast with an easement in gross, which might be a right to park one's antique car at a friend's house and gain ingress and egress for purposes of using the car. This easement is personal and not tied to any particular real estate. • This is a tricky area of the law that generally requires the assistance of a lawyer specializing in complex real estate issues. The seminal case on the subject is the 1850 English case of Ackroyd v. Smith.